The ways of representing information and content are increasingly dominated by the interactive technologies of digital media. Today design professionals must navigate the constantly changing world of digital technology in order to give consumers a positive aesthetic experience. 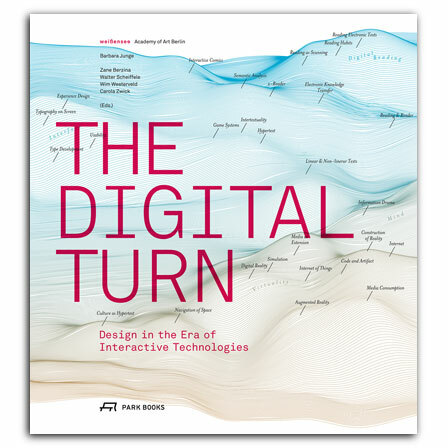 The editors of this wide-ranging volume work in four different disciplines—conceptual development, interactive design, visual communication, and digital media—and they provide a uniquely multifaceted and profound overview of how designers can respond to the challenges posed by interactive digital technology. Looking at both the obstacles that the digital world creates for designers, and also the opportunities to do new and boundarypushing work that it provides, The Digital Turn is a complete account of designing with interactive technologies. Hundreds of images are included to supplement essays by a wide variety of international professionals, teachers, and students, all of whom deal with designing in the age of digital interaction every day. With contributions by Carola Zwick, Zane Berzina, Barbara Junge, LustLab, Alan Kay, Maggie Orth, Kenya Hara, Paul Kahn, Troika, Friedrich Schmidgall, Petr van Blokland, Darryl Feldman, Constantin Andiel, Christoph Mille, Arjen Mulder, Marie O’Mahony, Susanne Stage, Simon Taylor, John Warwicker, Daniel Berwanger, Berit Greinke, Alexander Behn, Dietmar Offenhuber, Carlo Ratti, Bjorn Bertrand, Casey Reas, Friedrich Blauert, Janis Jefferies, Markus Hanzer, Nadia Graf, Adrian Muller, Michael Grosch, Nicholas Negroponte, Oliver Reichenstein, Stu Campbell, Wera Fleck, Alessio Leonardi, Carla Hesse, Hartmut Bohnacker, Benedikt Gros, Julia Laub, Konrad Hempel, Lev Manovich, Niko Spelbrink, Susanne Stauch, Theresa C. Mientus, Tincuta Heinzel, Sarah D. Rodriguez, Ursula Wagner, Anna Marin, Corinna Hingelbaum, Karen Minden, Lars Hubner, Christian May, Sandra Riedel, Sebastian Reichel, and Veronika Aumann. ist Interaction Designer und Forscher am Exzellenzcluster Bild Wissen Gestaltung an der Humboldt-Universität zu Berlin. Er ist Mitbegründer von ARCHIEXP.